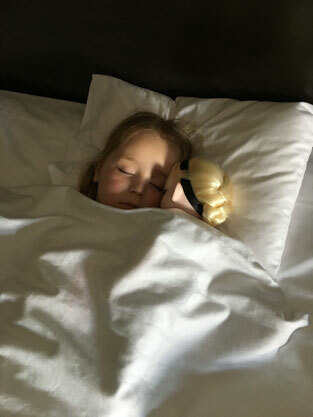 When my husband suggested that four-years-old sounded like the perfect age to take our daughter to Disney World, I’ll admit that my first thought was about sleep (go figure). We’d already agreed that we wouldn’t go before she’d dropped her nap, because strolling a preschooler around the Magic Kingdom desperately hoping for her to catch some Zs in the middle of a street parade sounded less than ideal to me. However, my daughter (now closer to five-years-old than four) had stopped napping months earlier, so I was open to the Disney talk. Fast-forward to February, and here we were, on our flight to Orlando. Tip # 1: Book flights for first thing in the morning. Of course, it’s tough to always book flights for exactly the time that suits your family’s schedule. But, whenever possible, book your flights for first thing in the morning, when your child is well-rested and at her freshest and most-content. Our flight to Orlando left at 7:30 a.m.; a little earlier than I would have preferred, as it meant we had to wake our kiddo up at 5:30 a.m. (luckily, we live very close to the airport). However, waking your child a bit early is generally a much better option than booking an evening flight and keeping your infant or toddler up incredibly late. Tip # 3: Get a room with a balcony. 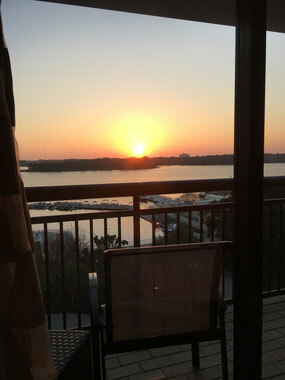 I would venture to say that having a balcony increased my husband’s and my Disney experience by about 25 percent. Why? Because after our daughter was tucked into bed, we spent three glorious hours drinking wine and chatting with one another on the balcony. No going to bed at 7 p.m. for us, nor huddling under the covers watching Netflix via iPad. Nope, we double-locked the hotel-room door, let our kiddo know we’d be just outside on the balcony if she needed us, and continued our vacation after her bedtime. Note, if you can’t get a balcony, then my recommendation is to make sure you take headphones and simply stay in the room and enjoy time together watching movies or catching up on your favourite show once your child is asleep. We woke up on our first full day at Disney, ready to take on Magic Kingdom! 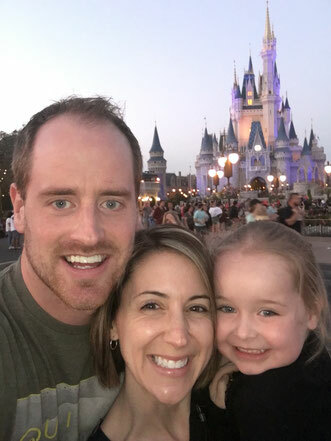 My husband and I got ready for the day while my daughter enjoyed what would become an extra-special-daily-Disney-treat in the form of 30 minutes of morning cartoons (if you can believe it, Disney Junior seems to be on hotel televisions 24-hours per day there. Imagine that.) As we headed out the door on our adventure, I grabbed the umbrella stroller we’d brought along. Tip # 4: Bring a stroller. A friend (another sleep consultant, as a matter of fact!) 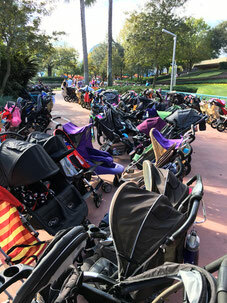 had recommended that we take a stroller with us to Disney World. My husband and I were both skeptical – our daughter hadn’t used a stroller in almost two years, and it felt odd that we’d be pushing our (extremely tall) almost-five-year-old around in the same little buggy she’d used when she was a toddler. But, we threw it in with our checked luggage anyway, for good measure. Thank goodness we did! Here’s the thing about Disney World: It. Is. Freaking. Huge. You walk, you run, and you rarely ever sit down unless you are strapped into a teacup or a flying circus elephant. What this means for young children is: sheer exhaustion. Having a stroller with us allowed our daughter’s little legs to take a break when we were on our fourth (or fifth, or seventh) straight hour of walking. It also allowed Mom and Dad to enjoy the less kid-centred attractions with the whine-factor greatly reduced. For example, on Day 4 of our trip, we visited Epcot, which, once we’d done the Frozen section to death, wasn’t incredibly interesting to our kindergartener. Meanwhile, my husband and I were excited to visit the World Showcase, and each of the various countries’ pavilions throughout the park. The stroller meant that our daughter could chill out (ok, she had ice cream for added-contentedness) while we took a long and leisurely stroll through attractions that were aimed at an older crowd. Tip # 5: Plan for naps, even if your child doesn’t nap anymore. When we left for Disney World, my daughter hadn’t napped - not even a teeny cat-nap in the car - in more than 10 months. But, guess what? She napped at Disney. Everyone naps at Disney. I saw kids napping in strollers, on parents’ shoulders, hunched over on park benches, and even one child (who appeared to be at least seven-years-old) napping on the floor in the middle of a buffet restaurant with a blanket over him. My suggestion is to plan for naps (rather than doing the floor-of-the-restaurant variety), and have your little one rest at your hotel in the middle of the day, when you can. Of course, you are on vacation, and you are not going to stall the middle of every single day to trek back to your hotel for a nap that may-or-may-not even happen. But, when you can, and when it makes sense, it’s a good idea to try for those naps. Well-rested children (and adults) cope with new and exciting situations and simply have more fun when they are well-rested. And, happy, well-rested children make for happier, more contented parents. All of this equals a much more enjoyable vacation for the whole family. We planned naps around the days we wanted to keep our daughter up late to watch the fireworks display at Magic Kingdom. We planned for two nights of fireworks during our seven-night stay at Disney, so that we could help our daughter catch up on sleep on the days in between. So, on the days we didn’t go to the fireworks, we had big, full, exhausting days and put her in bed by 7 p.m.; and, on the days we did stay up for the fireworks, we took a break from the parks in the early afternoon and had her lie down for an hour to get some rest. And, she actually napped. We set her Gro Clock for an hour, and had to wake her up. Apparently, having fun is exhausting! 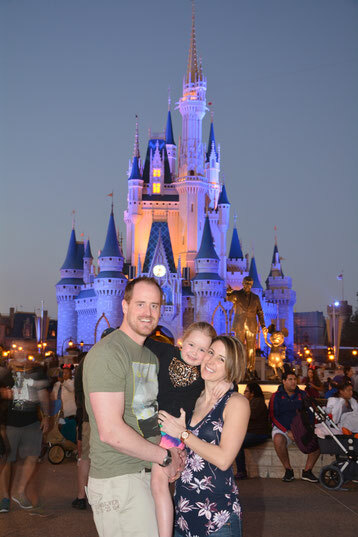 However, this mid-day rest made the 7:30 p.m. light show on Cinderella Castle, and the 8 p.m. fireworks display, so much more enjoyable and magical – she was in great spirits, energized, and completely mesmerized by it all. And, she wasn’t in overtired-meltdown-mode by the time she finally hit the hay two-hours after her usual bedtime. Tip # 6: Give yourself a break, and enjoy this time with your family. In my humble opinion, after having spent a week there with my family, whoever coined Disney World “the happiest place on earth” was spot on. It is remarkable. Every single person who works there – from the gentleman helping you swipe your “Magic Band” at the park entrance, to the lady assisting you aboard the “People Mover” train, is phenomenally friendly. Every corner you turn is exploding with bright colours, vivid sounds, and opportunities to make memories as a family. We’ve been home from our trip for two weeks, and our faces still hurt from smiling. Our daughter became more mesmerized every time another princess said hello to her, and found her inner-daredevil by going on roller coasters that even my husband and I were nervous about (again, she is inordinately tall for her age; hence how she was able to get on some of the amusement park’s biggest rides!). We made incredible memories as a family, as a result of doing new things together, and simply having time to focus on one another. 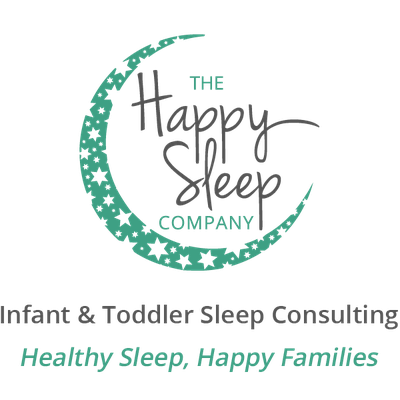 Yes, as a sleep consultant, I feel strongly that much of the enjoyment of our trip was related to our daughter getting proper rest; it meant she was able to handle such a vastly-stimulating environment without the meltdowns associated with overtiredness. So, my recommendation, if you can swing it, is to take a look at the suggestions above and do what you can to respect your child’s sleep while enjoying the world’s most magical place. But, with that said, as you can see, even I broke the rules at Disney World! I guess the magic got to me, too.